Sometimes it takes just one showdown for a great poker player to change their game plan and start crushing opponents. In this article I will teach you how to start thinking like a truly great player when it comes to making these immediate adjustments. You will first be presented with three hand examples that reach showdowns, and then I’ll explain the counter strategies that you should apply the very next hand. Each of these examples features a player grossly misplaying a hand to the point that it reveals massive holes in their strategy. But before we delve into the topic, I want to caution against having 100% confidence in your reads. Every player has a certain degree of randomness in their decisions (especially inexperienced ones). Just because you saw someone play a certain hand a certain way does not mean they will definitely play it the same way again. People tend to play consistently, but they don’t always play consistently. Okay guys, let’s get started. 3-betting is a very powerful and useful weapon to have in your arsenal, especially when you are in position against an open-raiser. However, there are limits to its utility, and it’s very easy to over-bluff when you consider how few value 3-bets you can have in certain spots. This first example features a player who is probably too infatuated with 3-betting. PokerStars $0.25/$0.50. 6-Handed. Effective Stacks $50.00. Focus only on the hand that the button has shown down, and not the postflop action as that is beyond the scope of this article. Now, before I explain the super-profitable exploits that you can come up with after just this one showdown, I want you to take a minute to think about one way you might exploit this opponent. Done? Okay. Let’s discuss how to increase our edge against this opponent! Want to be the best poker player at the table? Start crushing your competition with the expert strategies you’ll learn inside Upswing Lab. We should always start from what we know. What do we know? If you have been following Upswing for some time, you probably know that a balanced preflop 3-betting range contains approximately 50% “value” and 50% “bluffs”. “Value” and “bluff” are in quotes because these two concepts don’t strictly apply to preflop, when equities run so closely together. For example, 65s has 39% equity against AK. Our opponent’s “value” 3-bet range can be as wide as QQ+, AK, which makes up 2.5% of all possible starting hands. This means that his 3-bet “bluffing” range should also be around 2.5% to be unexploitable. So, he needs about 34 bluffing combos. If he decides to 3-bet A4o, what stops him from deciding to 3-bet A5o, A3o, A2o, and suited aces as well? Including all of these would mean he has around double the amount of “bluffs” he needs in order to be unexploitable. This imbalance is a huge leak. We can confidently assume that a guy who chooses to 3-bet this hand is very likely to 3-bet the other low Ax hands, and probably even more offsuit hands than that. We will start widening our 4-bet bluffing range. We would prefer hands that do not contain an Ace, since we know that his bluffing range is Ax heavy, but those will do fine as well. We will choose a slightly smaller 4-bet sizing. For example, if we were normally to go for 2.5x, we will go for 2.2x. This gives us better odds on our bluffs because our opponent will fold just as often against the smaller sizing as he would against the larger one. 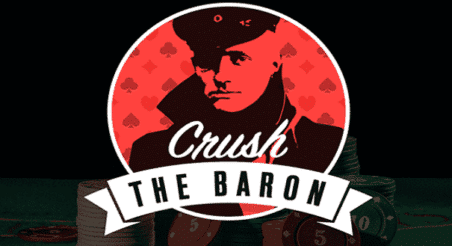 We will widen our 3-bet calling range to include more Ax hands that dominate his bluffing hands. So, if we were to fold hands like A7s before, now we will be calling. Even AK is an appropriate call, since we will have extremely good implied odds when we both hit the Ace. She’s nuts for thinking top pair is the nuts. We all get a mini-rush whenever we hit a top pair. But not all top pairs are created equal, and so the amount of money we should put in the pot with them varies from one situation to another. Here’s an example of what not to do when you hit top pair. 888 $0.5/$1. 6-Handed. Effective Stacks $100.00. 3 folds. BU raises to $2.5. sb folds. Hero calls. Before we start printing money against this gal on the button, I want you to take another minute to think of one way that you would exploit this specific opponent. Done? Great! Let’s follow the process that we established in the first example. What do we know? In this case, we know that a profitable value bet on the river needs to win over 50% of the time when called (otherwise the bet loses money). Alternatively, a profitable bluff needs to make our opponent fold a certain percentage of better hands based on the bet size that we use. So, let’s figure out if the button can profitably value bet with K9 on the river. In the Flopzilla calculation below, we can see that she cannot actually be value betting against our range on the river because, if we call based on the minimum defense frequency concept on the river, then she will only win 23% of the time (pictured in the bottom right of the calculation). Interesting note: Our continuing frequency on the river is only 50% because of the blocking effect of her hand, which would otherwise be 60% (roughly what we need to defend against her bet size). In other words, the blocking effect of her hand make it an even worse value bet. She is also not bluffing on the river because every hand that we will fold is worse than K9 (pictured in the range below), hence the 100% equity versus our folding range (pictured in the bottom right below). So, now that we know that her bet on the river is a mistake, we will go to the next step: EXPLOITING! Relentlessly attack her check-back range with over-bets for thinner value than normal, and add the appropriate amount of bluffs. We could also overbluff in this case. Delay our value raises to a later street. This adjustment allows us to extract as much value as possible from her mistake of over-value betting. Call down a bit tighter than normal because his river betting range is probably lacking bluffs and is wider for value. This means that our normal bluff-catching range will shrink due to the exclusion of the lower part. The good news is that the top part of the bluff-catching range will now over-realize its equity. Make our raise sizes smaller. This adjustment works well because we will be using a value-heavy range that contains a lot of thin value bets. I love to catch bluffs! Let’s face it, we all love to catch bluffs! That being said, too much of anything is bad, and so we should resist the impulse to bluff catch all the time. Below is an example of an opponent who doesn’t quite understand this. UTG raises to $2.5, 2 folds. Hero calls. 2 folds. You know the drill! Take a minute to think hard about a way to exploit this opponent’s tendency. We start once more with what we know. We know that on the river we want to have bets for value and bets as a bluff, and the optimal proportion is based on the bet size we use. In this case we can clearly see that AQ is a value bet, so this is an obvious mistake by our opponent. Now that we have identified a deviation from what is correct, the exciting part begins: Creating a counter-strategy! Call down very light against his triple barrels when he is out of position (OOP). This adjustment works well against a range that is likely heavily unbalanced toward bluffs. Over-call against the turn c-bet. Doing so will allow us to over-realize our equity on the river when we bluff catch against his river betting range, and we’ll get to check-back against his strong checking range. Do not bluff once he checks after barreling twice OOP. We’ve already fallen for that once, so let’s not let it happen again! Tighten our value betting range and work in overbets. Overbets will be very handy in this spot because his range will contain strong hands that will check-call a very big bet and they will out-number the possible nutted hands that he slow plays (we don’t know if checks with AA, QQ or 33 on the river). I’m excited to hear what y’all think of my first article here on Upswing, and I’m happy to answer any questions. Hopefully you have gained some insight into how great poker players think when they see their opponents show down a hand. The Author of This Article Got His Start in the Upswing Lab. Why Not You? Master expert strategies in the 54 learning modules and 123 Play & Explain videos inside our flagship training course.